Pale relatively clear yellow in color, not the cloudy yellow I'm used to for wheat beers. Lemon, banana, clove, and some off bread notes on the nose. Nothing too inviting - the smells are kind of just there. Taste is a real let down - water down citrus and a touch of banana with dry finish. Mouthfeel is rough due to the heavy carbonation. I don't know - I thought I liked this when I first tried a few months back, but now it just doesn't do anything for me. Recommendation to avoid. This is an excellent German Stlye Wheat beer. If you close your eyes you might think you are in Munich. It has the classic "banana & clove" smell and taste. Excellent appearence, nice lasting head, and great aroma. Put your Lederhosen on and enjoy a cold one. Great job Flying Dog!! This beer came in a variety pack. If it had not, there is absolutely no way I would have purchased it. To start, the beer name is "In Heat Wheat." The name is about as appetizing a dog's seminal fluid. In fact, if I had the choice of trying this beer again or drinking a dogs ejaculatory fluid, I would invariably choose the later. This beer was downright awful. I suggest we use it to torture terrorists. I know I would talk. The flavor was that of rotten banana's that had been strained through dirty gym socks filled with diarrhea. Every single aspect of this beer was awful. I beg you, for your mental well being, don't drink this beer. Too heavy on the cloves. This was one of the least enjoyable wheats that I've had in a while. It tastes a bit like a bitter Miller High Life. It's too carbonated, and the bitterness leaves a pretty undesirable aftertaste that lingers for a while. There was no head to note. T- Taste is good, pretty clean with minimal hops, pretty sweet on the tongue. Has a slight after taste that lingers a bit. M- decent mouth feel, a bit thin but easy to swish and swirl about. A- Where is the head on this beer? It was non-existent. The color is a nice straw color consistent of what I want in a wheat beer, but the no foam kills the appearance. S- The smell is really good. A nice citrusy smell to it. It smells like what I expect from a wheat beer. T- The wheat beer taste really comes through in this beer. I get the banana taste that I like in a wheat beer. Very good taste to the beer. M- A little bit thick. I has a nice feel and the flavors definitely come through. D- Can't knock the drinkability of this beer. I am a fan. It is not a filling beer. This is a solid beer. I actually enjoyed this one. A little cloudy, characteristic of a good weiss. In the background there are some fruity notes, maybe a little banana. I was most surprised because it is a german style wheat, and not an American. It has a nice yeasty flavor, smooth and full-bodied. This beer pours a fairly nice cloudy golden hue with a quickly fading head. Smell is consistent with typical hefeweizens of banana, citrus, and cloves. Mouthfeel is light and slightly carbonated making this brew easy to drink. Taste is almost a cross between a hefeweizen and an american light lager with bitter undertones hardly noticable. Pours a hazy pale yellow with medium white head which sticks around pretty well. Good carbonation visible with a bit of lacing. Wheaty aroma with good clove spice backing. A touch of banana in there as well. Very sweet with lots of banana flavor. Not too much in the way of spice notes here though. Turns doughy and sweet midway through, leaving a lingering wheaty, sweet aftertaste. A medium to light body with plenty of crisp, lively carbonation. Overall a lot of good spice in the aroma and banana in the flavor but this beer didn't tie it all together as well as other hefeweizens. Very wheat forward and a bit too sweet for the style in my opinion. Pours a hazy straw color with a thin, fizzy head. The head lasts hardly longer than 30 seconds and then it is completely gone. Smells of clove and ripe banana with a faint hoppiness. Very light in flavor, although I do get a good yeasty, phenolic character from this. Some bitterness is present, but it's not enough to ruin this. The only thing really out of control here is the sour twang. It seems to go a bit overboard. Also, there's a strange flavor of club soda in the finish that I didn't like. Overall, though, this tastes pretty decent. Too watery in the mouthfeel. Like my comment on it's club soda-like flavor at parts, the mouthfeel here really reminds me of club soda. Kind of harsh, forced carbonation. Too light for me, but just enough flavor to make this decent. A: Cloudy banana peel, with a dense white head. Retention is quite good. A fair amount of lace is left behind. S: Lots of banana at work here. It dominates the nose. Behind it are aromas of cloves and biscuits. T: Banana sweetness comes through strong. Raw husky wheat, plus a lemon and clove bitterness are just present enough. Tart, sour and dry in the finish. M: The grainy body has a little less carbonation than I expect from this style. D: A very refreshing beer. 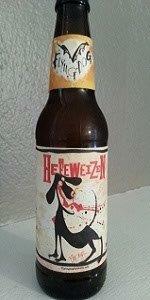 One of the better Flying Dog offerings in my book. I'm glad I had it. Appearance: It has a good off-gas when the top was popped, and it pours a very clear yellow color with a huge 2" head of pillowy foam. The head was still at least half if its original height over a minute after the pour maintained by a whole bunch of bubbles rising. There is a considerable amount of lace left on the glass after drinking the beer. Aroma: My first impression was of subtle grassy hops mixed in with some grainy bread-like malts. It has some of the banana esters from the yeast, but they are reserved. It has some sweetness giving it a mild dessert like overall aroma. Taste: The flavor is very mild compared to the aroma. There is some subtle malt in there along with the hops and fruity flavors, but the malt is the one in charge. As the beer warms up some, the banana comes out more as does a lemony flavor that makes it rather nice to drink. The finish is slightly sweet with only a faint hop presence. There is no alcohol noticeable the entire time. Opinion: Actually I remember that I didn't really care for this beer right after I got the six-pack, but this lone bottle has been living in the back of my fridge for about a year for me to review. It has actually gotten nicer as it lagered for the last year. You would expect a beer this light to have fallen apart, but meybe they were selling it green. Either way it isn't bad now and I won't be a snob and crinkle my nose at it in the future. A- Hazy clouded dark straw yellow. Small white head that turned instantly to a foam cap. A- Wheaty dirty dishwater smell. T- Nice full bodied wheat flavor. Reminds me of my first german hefeweizen to which I exclaimed, "it tastes like a field of wheat in my mouth!" Very nice! M- Medium heavy body, extremely smooth. Moderate carbonation, could be a tad more carbonated. D- This one surprised me. The aroma and lack of head weren't looking to promising, but the taste of this brew is great. I might consider picking this up again.